FALL. Right now I’m doing my best to enjoy every glimpse I can of the sun before the darkness hits the nordic countries. Yesterday was one of those magical, crisp fall days with blue skies and wonderful sunshine, so I threw on a cozy wool sweater and took a nice walk among the colorful, fallen leaves. I honestly can’t believe November is already around the corner, where did time fly? ASOS beanie. MAJE jacket. KENZO sweater. TOPSHOP pants. KENZO bag. 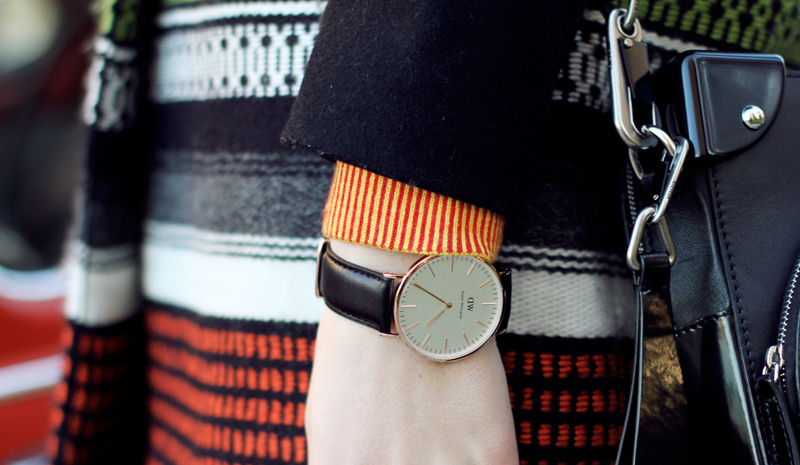 DANIEL WELLINGTON watch. DIN SKO shoes. This entry was posted in Outfit and tagged daniel wellington, kenzo, Maje by Carolina Engman. Bookmark the permalink. Beautiful outfit! I love the jacket and the color of your sweater! really love your watch…have a good sunday! I love these pictures, and I love that jacket! Love that sweater and jacket! Gorgeous look dear ! Your jacket and bag are so beautiful ! Time flies so fast! I really like the jacket you’re wearing! It looks very pretty on you. great pictures!!! love your look here! fantastic outfit. you look great!!! So in love with your jacket!! You always look so pretty and stylish! Gorgeous cardigan! you look very cute!!! Awesome! I just love your Kenzo sweater , and the entire outfit indeed . Thank you for this lovely post , you are beautiful as usual . The jacket reminds me of retro alpine fashion, very nice! Already feels like the heart of winter already in Edinburgh. How I love this style! The orange sweater and the beautiful coat are a great mix! Great pictures! Beautiful watch and the Maje jacket is fantastic! I love this coat so much!!! I love your jacket and your jumper. It looks really festive. Gorgeous. Beautiful outfit! I really love your sweater and coat! Amazing photos! Love the background and obviously your jacket! Lovely look! Nice sweater and great booties! Don’t miss my last post with my NEW INs and the previous one with my last Animal Print watch. I hope you like it! Love the pictures and the look. Gorgeous! I love all of the bold colors and the cool patterns! Great look! I hope winter takes it’s time in getting here. In love with your watch! Really nice outfit! You look absolutely beautiful. It feels like yesterday it was summertime, seriously! Love the coat! It’s fantastic! I honestly can’t imagine myself living in the darkness for months, it would drive me nuts!! But I like the way your comfy look turned out :) you look pretty! Beautiful! Love your jacket! That purse isn’t my favorite, but looks great on you..
Aah I really love your watch! You look so perfect! And I love the car in the background ? So nice pics and style. Great. I love the Autumn shades in your jacket. Cool watch. 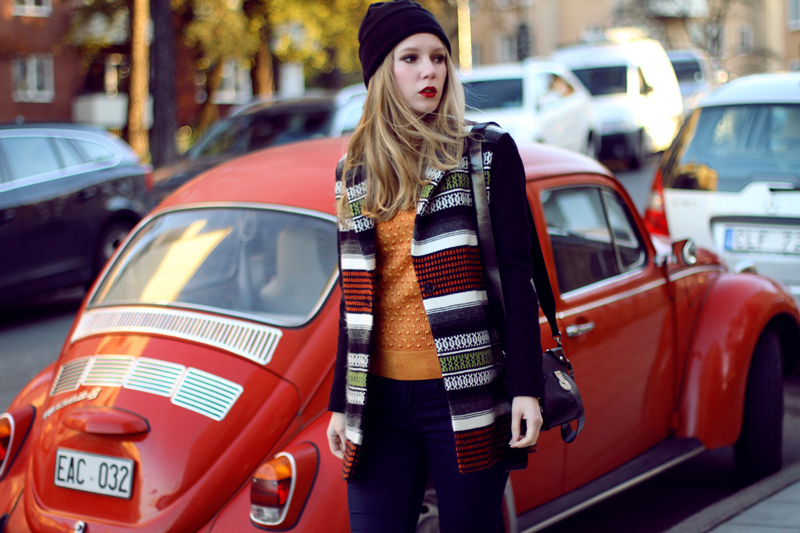 Love your outfit and the red Volkswagen in the back! so beautiful, I love those autumn-y colors on you! A nicely put together outfit. So refreshing to see winter clothes (and not shorts and bare legs) worn in cold weather on a weekday!! Love this look – the colours are fantastic! I love your watch and beanie! You remind me so much of Taylor Swift. I dont no if ive said this before. Beautiful! It’s especially great with the car! Beautiful pics! You did your best on that sunny day and the look is amazing. 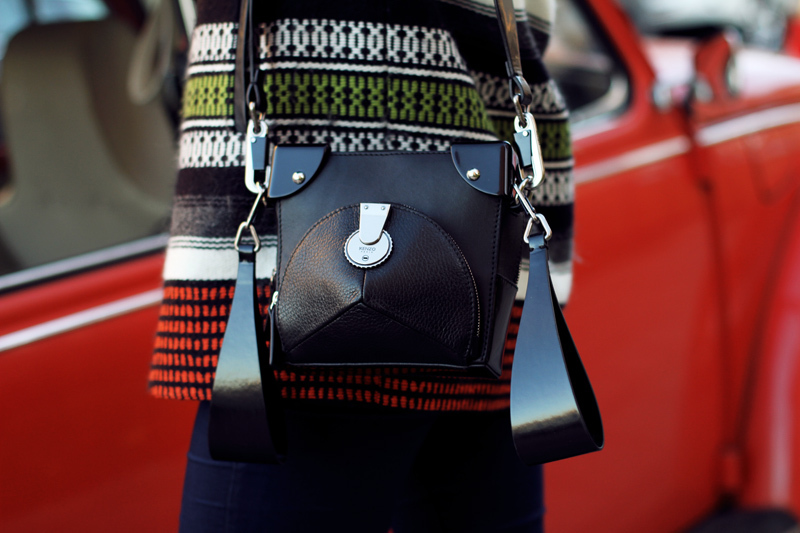 Love your Kenzo bag, so different! loving the colour of your sweater! You look gorgeous as always love! I love that orange sweater with that jacket! The colors are fantastic! So good!! This is a perfect fall look! lovee this maje jacket! perfect!! Love your sweater! Looking pretty! Very beautiful and cozy outfit! Love this look, perfect for fall! You have great style! Sweater,jacket,pant are stunning and you look amazing in this. I’m loving the Kenzo sweater! Gorgeous outfit and amazing photos!!! You are absolutely beautiful. I admire your style and your life as posted here on your blog. Thank you for sharing your lovely talent here for all to enjoy. Loving your blog -it’s so stylish! I’d love it if you could check out mine (shelovesitdotme.wordpress.com). Keep posting! I know what you mean, here rainy season is upon us! That great orange sweater should get you through the darkness! Wow!!!!! beautiful cozy wool sweater looking very rich,colorful and hope it is comfort to everyone.